What is Omnia.11 G-Force? - Broadcast Audio Processing World! Omnia.11 G-Force is a major update to the dynamics engines. 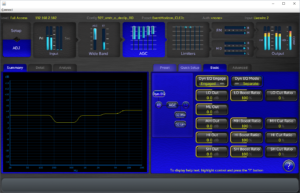 This “plugin” replaces the wideband AGC, Multiband AGC, and multiband limiter algorithms. Most notable in this change is the fact that the limiters now have powerful intelligent control over their activities. This means the new multiband limiters act in a very “positive” way, and also features extremely low IMD in the process. This means there is greater clarity, punch, and detail that comes through vs. the standard “stock” dynamics core. Live voices punch through more, and are better protected from clipper-induced distortion. There is also a dynamic equalizer section that does NOT use compression for its operation. It provides a high level of spectral consistency from source-to-source without ruining dynamics characteristics. Since this process does not use “compression” in it’s operation, there is no “threshold” to fight against. It does not care about overall program levels! This also means that the dynamic EQ will not find itself in conflict with the dynamics control sections that follow it. Spectral consistency without the “mush”. In the past, you had to gain consistency by pushing the multi-band AGC and Limiters sections harder. As a result, not only do you gain consistency, but you also pick up more “mushiness”. 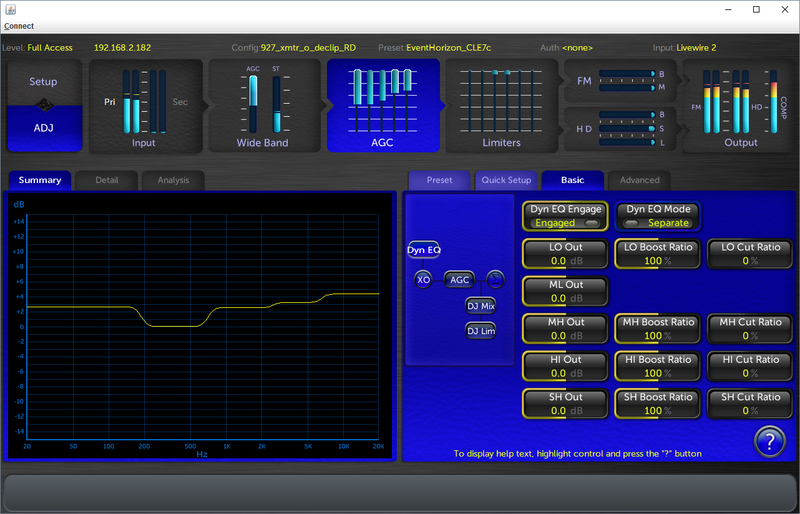 With the dynamic EQ, you are free to focus the multiband sections on optimizing RMS energy. As a result, the dynamics section is about a couple of dBs louder all by itself! This means you need LESS clipper activity to maintain the same (if not greater) loudness than before. Percussive sounds come through clearly, as does a lot of detail normally lost due to dynamics IMD. Hans Van Zuphten’s Perfect Declipper is the icing on the cake to all of this. AND it does work. On over-mastered materials it pulls out all of the percussive “punch” lost by the use of hard clipping to make the CD sound louder. Yes…the record companies are in their on loudness war with each other! Guess what. Radio is doing the same thing! We too are in a loudness war of sorts with our fellow broadcasters. The main difference for broadcasters is that the FM broadcast medium is not as forgiving as digital media. The FM pre-emphasis curve makes life especially difficult. This means that modern CD production with its highly dense audio mastering techniques comes across as sounding quite harsh over the FM radio. There is a solution! Hans Van Zuphten’s “The Perfect Declipper”. The Perfect Declipper gets rid of this layer of annoying artifacts from overmastering by restoring the waveforms clipped off by heavy mastering. It also regenerates a reasonable approximation of the harmonic content as well! The combination of new dynamics and The Perfect Declipper is an effective “1-2” punch for a new level of state of the art processing! Is it good? You can answer the question yourself for free. Just go to the Omnia section of the Telos Alliance website, and download the new version 3.0 update for the Omnia.11. Inside the 3.0 update is the section that allows you to demo the G-Force plugin for free!